At WellPoint, we believe there is an important connection between our members’ health and well-being—and the value we bring our customers and shareholders. 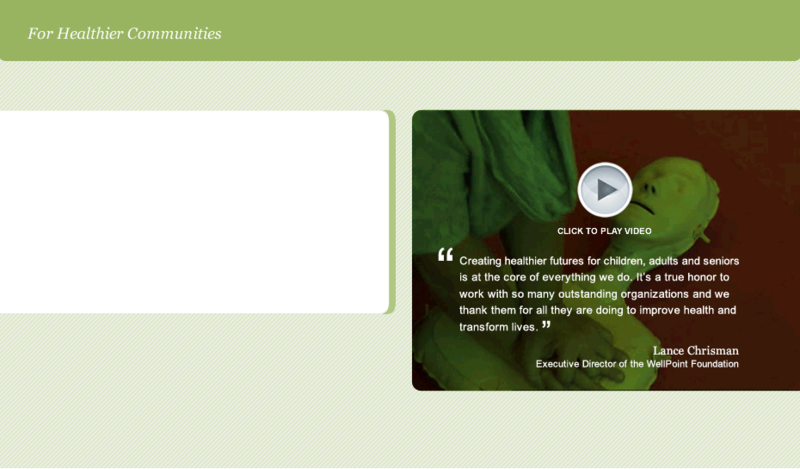 So each day we work to improve the health of our members and their communities. And, we can make a real difference since we have more than 36 million people in our affiliated health plans, and nearly 67 million people served through our subsidiaries. 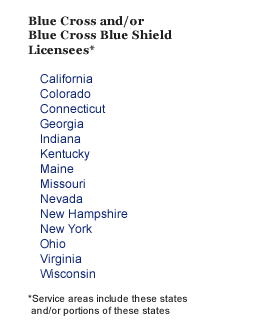 As an independent licensee of the Blue Cross and Blue Shield Association, WellPoint serves members as the Blue Cross licensee for California; the Blue Cross and Blue Shield licensee for Colorado, Connecticut, Georgia, Indiana, Kentucky, Maine, Missouri (excluding 30 counties in the Kansas City area), Nevada, New Hampshire, New York (as the Blue Cross Blue Shield licensee in 10 New York City metropolitan and surrounding counties and as the Blue Cross or Blue Cross Blue Shield licensee in selected upstate counties only), Ohio, Virginia (excluding the Northern Virginia suburbs of Washington, D.C.), and Wisconsin. In a majority of these service areas, WellPoint’s plans do business as Anthem Blue Cross, Anthem Blue Cross and Blue Shield, Blue Cross and Blue Shield of Georgia and Empire Blue Cross Blue Shield, or Empire Blue Cross (in the New York service areas). WellPoint also serves customers throughout the country as UniCare and in certain markets through our Amerigroup and CareMore subsidiaries. Our 1-800 CONTACTS, Inc. subsidiary offers customers online sales of contact lenses, eyeglasses and other ocular products. 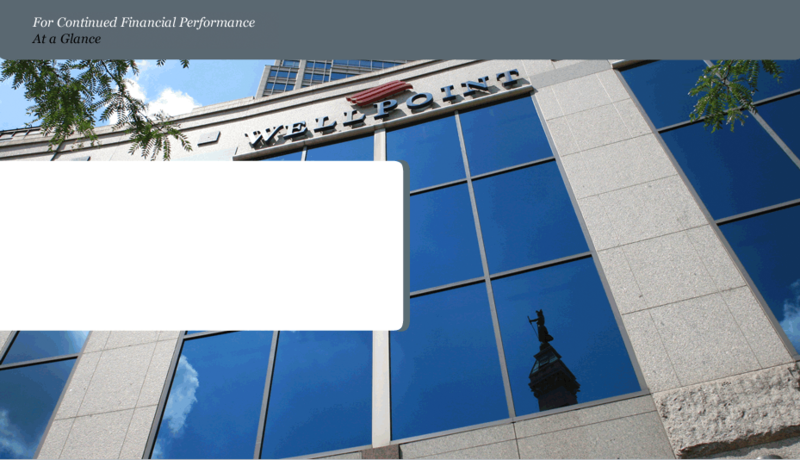 Additional information about WellPoint is available at www.wellpoint.com. 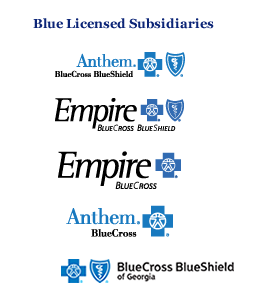 The Blue Cross and Blue Shield names and symbols and BlueCard are registered marks of the Blue Cross and Blue Shield Association, an association of independent Blue Cross and/or Blue Shield Plans. Lenox D. Baker, Jr., M.D. 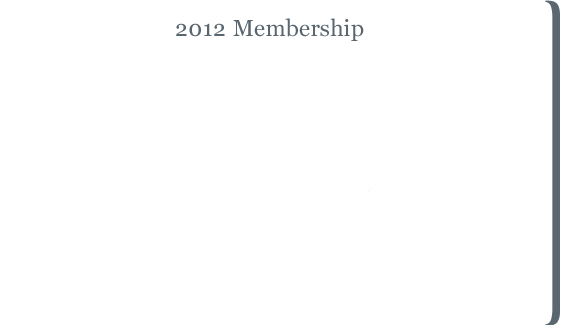 Former President, Mid-Atlantic Cardiothoracic Surgeons, Ltd. Please include your name, address and telephone number with all correspondence, and specify a convenient time to contact you. You can call Computershare toll-free at: (866) 299-9628 Monday through Friday, excluding holidays, from 9 a.m. to 5 p.m. Eastern Time. Our common stock, par value $0.01 per share, is listed on the NYSE under the symbol “WLP.” On February 8, 2013, the closing price on the NYSE was $66.28. 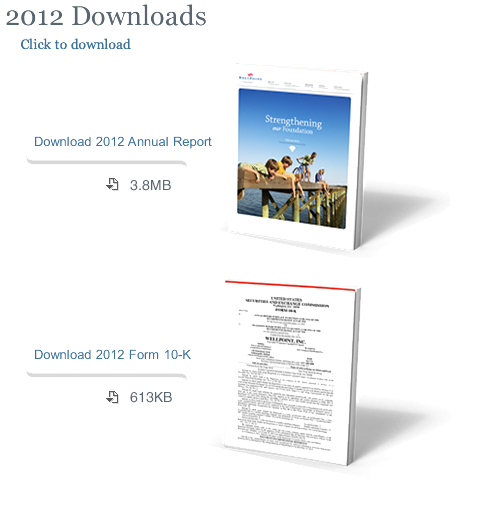 As of February 8, 2013, there were 304,035,158 shareholders of record of our common stock. The following table presents high and low sales prices for our common stock on the NYSE for the periods indicated. WellPoint, through its affiliated health plans, has significantly increased its investment in patient care by increasing revenue opportunities for primary care physicians, expanding on the CareMore comprehensive care model, and advancing the development of IBM Watson enabled products designed to help doctors make more informed health care decisions. A patient can feel confident knowing that WellPoint is making the right investments in a delivery system that has their best interests in mind—providing doctors with the tools they need to get their patients healthy and make sure they stay healthy. CareMore is proving that it can help people stay healthy and live longer while saving money in health care. CareMore provides comprehensive care to seniors—especially for those who are frail or those living with or at risk of developing chronic conditions such as diabetes or congestive heart failure. By focusing on head-to-toe health and wellness, CareMore provides members with education, disease management, fitness programs and other proactive services. Members can receive one-on-one care in their home, at skilled nursing facilities and in care centers. CareMore Neighborhood Care Centers offer members coordinated services from physicians, nurses and highly trained staff ranging from routine vital sign monitoring to regularly scheduled toe nail clippings. For some CareMore Medicare Advantage members, the personalized care includes weekly in-home visits by a nurse practitioner. 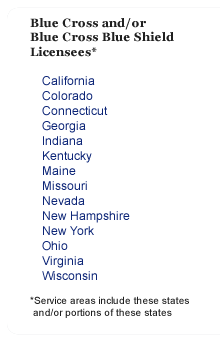 CareMore serves members in California, Arizona and Nevada and in 2012 WellPoint expanded the CareMore model for members in its affiliated plans in Virginia and New York. 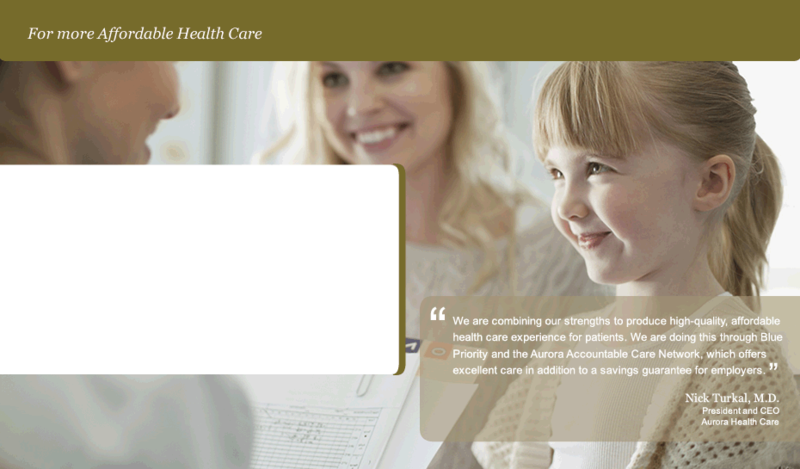 WellPoint understands that the doctor-patient relationship is important in health care. It is a key to improving health care quality and outcomes, and subsequently, lowering costs. Primary care can have a huge impact on achieving these goals through physician led care management, better coordination across the system, improved access and shared decision making with patients—all of which contribute to better engagement, better health outcomes and a more positive healthcare experience for consumers. That’s why WellPoint is expanding on the patient-centered medical home or PCMH model and making a meaningful investment in primary care by increasing revenue opportunities for primary care physicians, enhancing information sharing, and providing care management support to physician offices. Our nation’s health care system is complex, and health care information, from patient records to new clinical discovery, is rapidly evolving. That’s why we teamed up with IBM to address some enormous challenges facing the health care system. WellPoint, IBM and other key industry experts, such as Memorial Sloan Kettering, are creating new and exciting products utilizing the very latest advances in IBM Watson technology. We’re harnessing IBM Watson’s ability to analyze vast amounts of data quickly to help speed up the utilization management process, and to help physicians more quickly and accurately identify treatment options for complex health conditions, such as cancer. 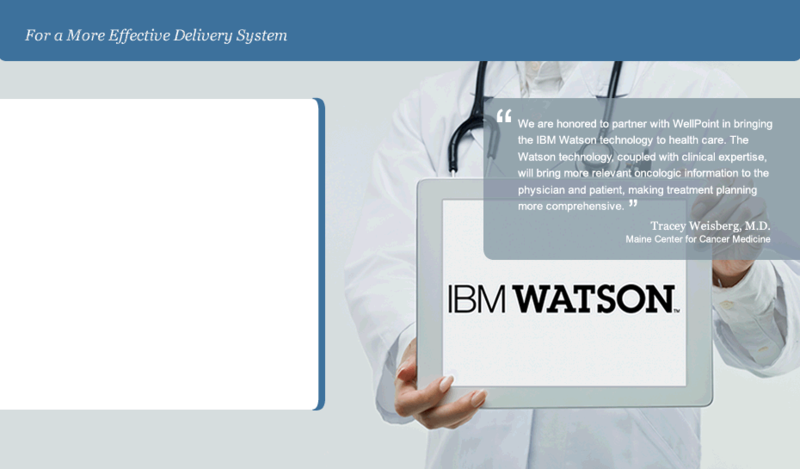 In 2013, WellPoint is working with oncologists from the Maine Center for Cancer Medicine and WESTMED Medical Group to test a new oncology product we developed with Memorial Sloan Kettering that utilizes IBM’s Watson technology. WellPoint, through its affiliated health plans, takes a holistic approach to caring for its customers—providing them with products and offerings focused on head-to-toe wellness and ensuring they get them at the best possible value. When people have the tools to get healthy, stay healthy and save money there is a sense of satisfaction. An enhanced consumer experience starts by putting the customer first, then offering tools to help them get fit, giving incentives for making healthier choices, and offering the products they need at the value they want. In June 2012, WellPoint acquired 1-800 CONTACTS, the largest direct-to-consumer retailer of contact lenses in the United States. 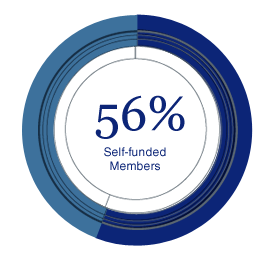 1-800 CONTACTS business model of delivering exceptional value to consumers through affordability, improved access and an unmatched consumer experience mirrors WellPoint’s core values of putting the customer first and commitment to excellence. 1-800 CONTACTS currently serves more than 3.1 million active customers through its easy-to-remember, toll-free number and its website. With more than 38 million contact lens wearers and 140 million glasses wearers in the United States, there is an opportunity to attract more customers, which aligns with WellPoint’s strategy to capitalize on growth opportunities and diversify its revenue stream. As the healthcare marketplace continues to evolve, consumers are and will continue to play a more active role in their personal and/or family healthcare decisions and it’s important that WellPoint provide affordable products and services that meet these needs and expectations. That’s why we’re focused on generating diversified new revenue opportunities and creating a portfolio of consumer-driven health and well-being capabilities via strategic investments and partnerships. Working with companies like FitOrbit, LinkWell Health, Physicians Immediate Care and SoloHealth aligns with our mission and supports our efforts to providing consumers greater value, more convenient access, and a better overall experience. As individuals take greater control over their health care, improving the consumer experience is more important than ever. The Personalized Well-being product suite brings together the tools, programs and technologies to make it easy for members to engage in and manage their health and wellness—when and where they need it. WellPoint has made the investments to become a strong competitor and create more affordable health care choices for consumers—enabling its plans to offer lower premium narrow network options, creaing a product portfolio that meets the needs of all consumers, and acquiring one of the nation's leading Medicaid managed care companies. 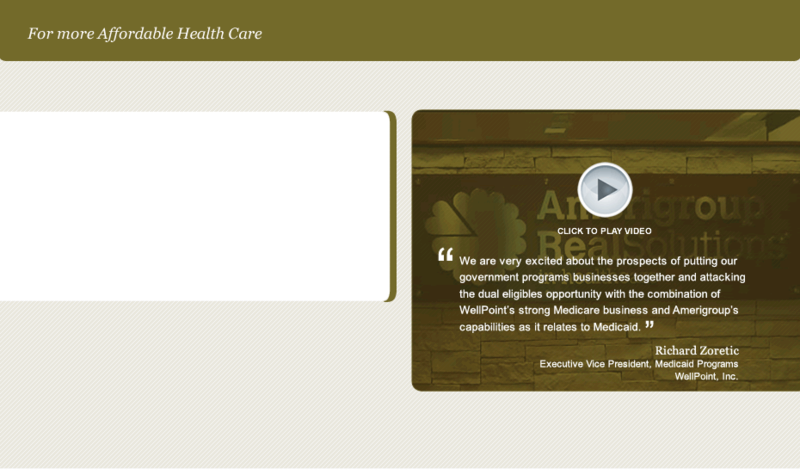 Anticipating growth opportunities in the Medicaid marketplace, WellPoint acquired Amerigroup in 2012. Managed care companies like Amerigroup, which specialize in Medicaid, will play a vital role toward improving care and helping state and federal governments better manage their health care costs. WellPoint is now the nation’s largest Medicaid managed care company after its acquisition of Amerigroup in 2012. WellPoint and Amerigroup have a common goal of creating better health care quality at more affordable prices for their customers. There are significant growth opportunities in the Medicaid marketplace and WellPoint’s acquisition of Amerigroup positions the two companies to more effectively and efficiently serve the Medicaid population, including the expanding dual eligible population. Every industry has seen the needs and demands of its customers change and evolve but affordability remains a constant. In health care, it is among the highest priorities for employers and all consumers. WellPoint is committed to providing value-driven solutions to meet their needs. Enabling its plans to offer a strong product portfolio that includes narrow-networks is important for all market segments, including small, mid-size, large and national accounts, as well as the individual market. 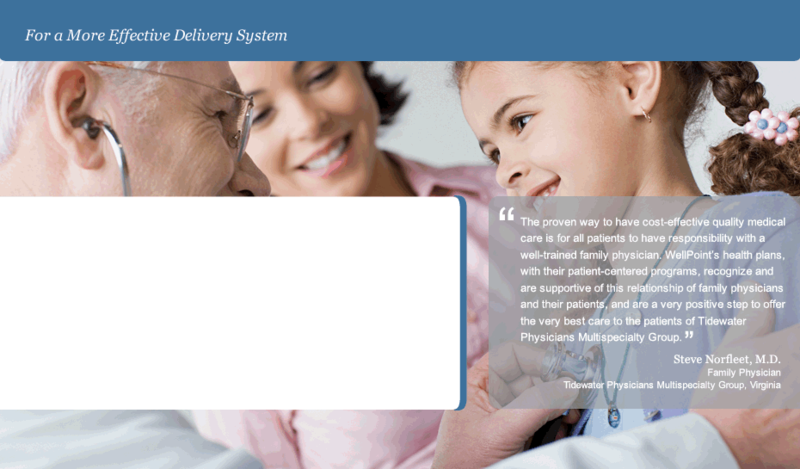 WellPoint’s plans are working with health care professionals and provider systems to improve care coordination and invest in the doctor-patient relationship. 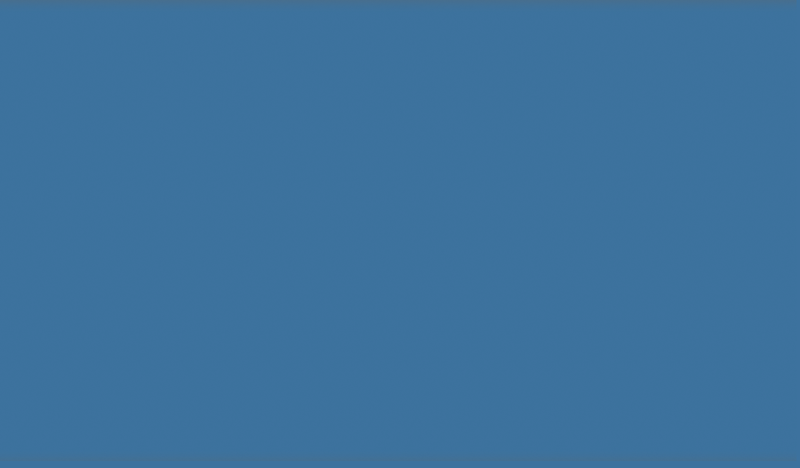 Central to this work is a collaborative effort between WellPoint’s plans and provider networks, resulting in quality, cost-effective health care. 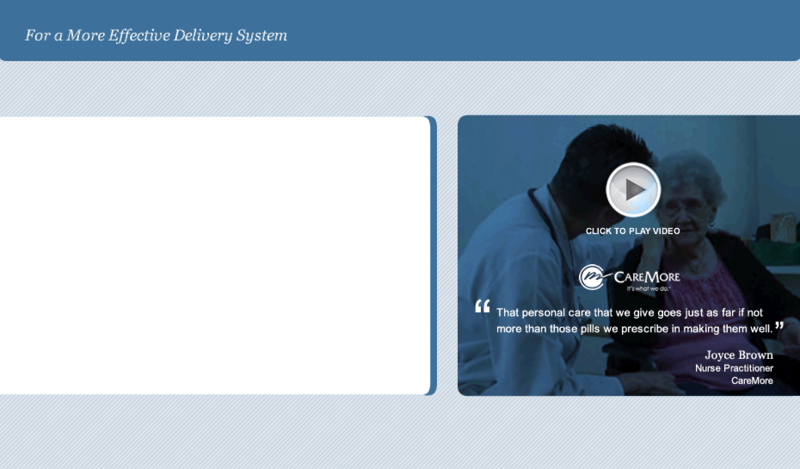 The Health Marketplace is changing the way health benefits are offered. Employers can now let their employees shop online for the plan that best meets their needs. With employers setting an exact budget for employee health benefits through defined contribution, each employee gets a fixed amount of money for these benefits. Bloom Health, a leader in health insurance innovation, pioneered this approach and now powers Health Marketplace. This allows employers to manage their health care spending while giving employees more flexibility and health plan options. The Health Marketplace offers a fresh solution to our customers' number one priority—managing costs. 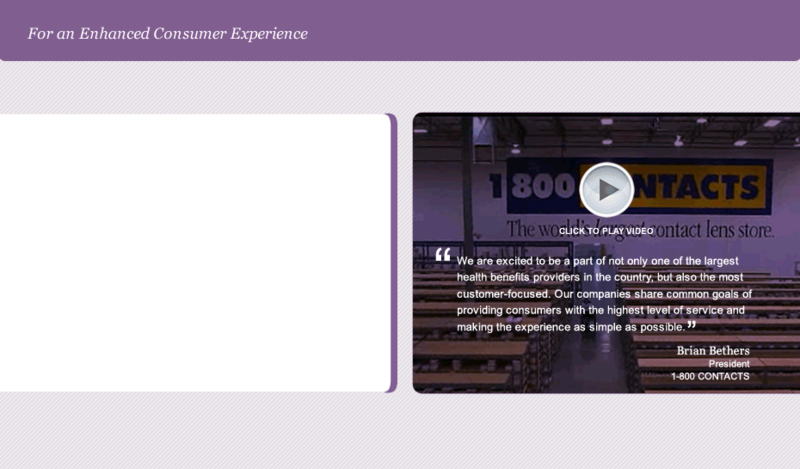 It also offers choice and personal guidance to ensure consumers select a plan that is right for their unique needs. Ultimately, Health Marketplace offers a solution for a win-win with both employers and employees. WellPoint is improving the health of the communities we serve by investing in those communities. 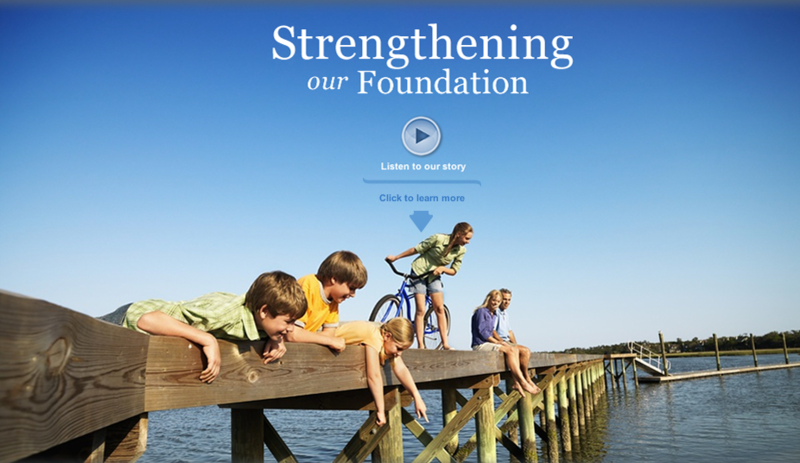 The WellPoint Foundation has strategically funded programs across the United States that advocate healthy behaviors, promote health-risk prevention and foster healthy environments. Our associates are just as committed to the mission. They have pledged their money to national and local charities and worked alongside their family members and friends volunteering their time at local organizations. The health-improving mission of WellPoint is enhanced and supported by the WellPoint Foundation. Through its Healthy Generations grant program, the WellPoint Foundation works with leading nonprofit organizations—such as Boys & Girls Clubs of America, American Cancer Society and OASIS Institute—to address some of the country’s most pressing health issues. Funding is focused on programs with measurable results and tracked outcomes to ensure the projects make a positive impact in the community. In 2012, the WellPoint Foundation kicked off a three-year, $4.5 million grant to support the American Heart Association’s Hands-Only CPR awareness and training campaign. WellPoint associates, friends and family members come together once a year to participate in the company’s annual Community Service Day. 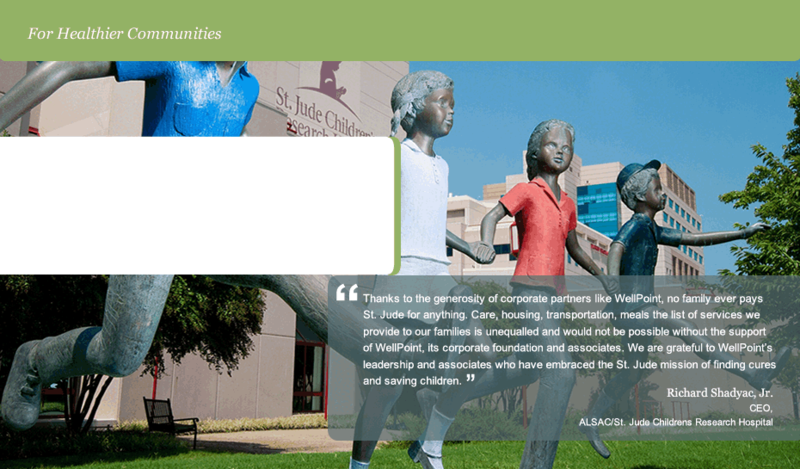 Projects benefit local nonprofits and community organizations. At the April 28, 2012 event, WellPoint volunteers planted 202 trees, sorted 48,260 pounds of food, beautified 56 acres of land, and engaged with 750 seniors and children, and much more. Each year WellPoint associates advance the company’s commitment to strengthening communities by supporting health-focused charities through the WellPoint Associate Giving Campaign. Associate pledges receive a 50 percent match from the WellPoint Foundation. WellPoint is utilizing its financial resources to position for coming growth opportunities and enhance value for customers and shareholders. 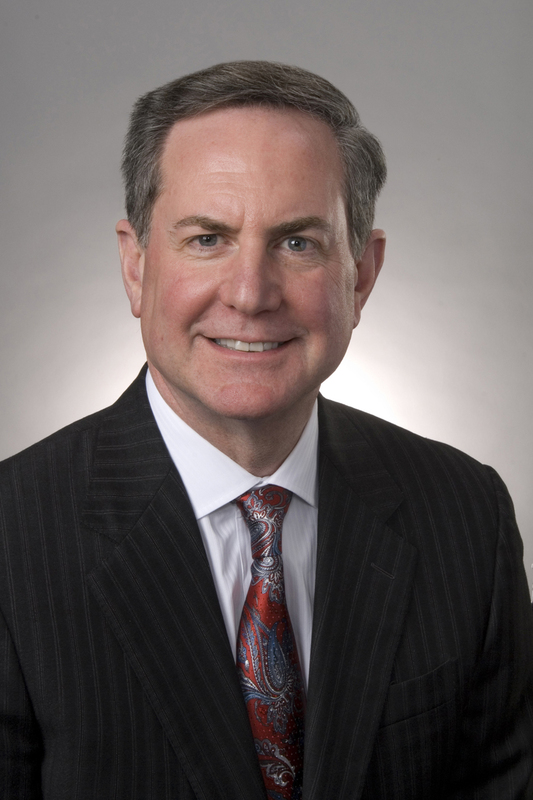 Recent acquisitions of Amerigroup and 1-800 CONTACTS have increased WellPoint’s services and capabilities in key markets, while investments in the expansion of the CareMore model and in preparation for health insurance exchanges reinforce the company’s focus on driving greater accessibility and affordability for consumers. WellPoint’s commitment to investing for the future has been supported by consistent earnings per share growth and a strong share repurchase and dividend payment program. At WellPoint, we believe there is an important connection between our members’ health and well-being—and the value we bring our customers and shareholders. 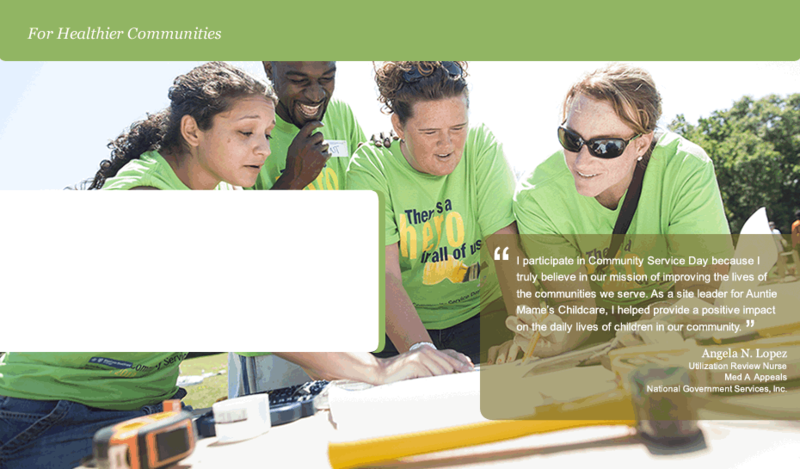 So each day we work to improve the health of our members and their communities. And, we can make a real difference since we have more than 36 million people in our affiliated health plans, and nearly 67 million people served through our subsidiaries. *Adjusted Diluted Earnings per Share is a non-GAAP measure and excludes certain income and expense items. on Form 10-K for a reconciliation of the non-GAAP measure to the GAAP measure.